simple matters: kenya cummings, farai harreld, and yolanda acree. – Reading My Tea Leaves – Slow, simple, sustainable living. simple matters: kenya cummings, farai harreld, and yolanda acree. Black Minimalists is a website and community founded in 2017. 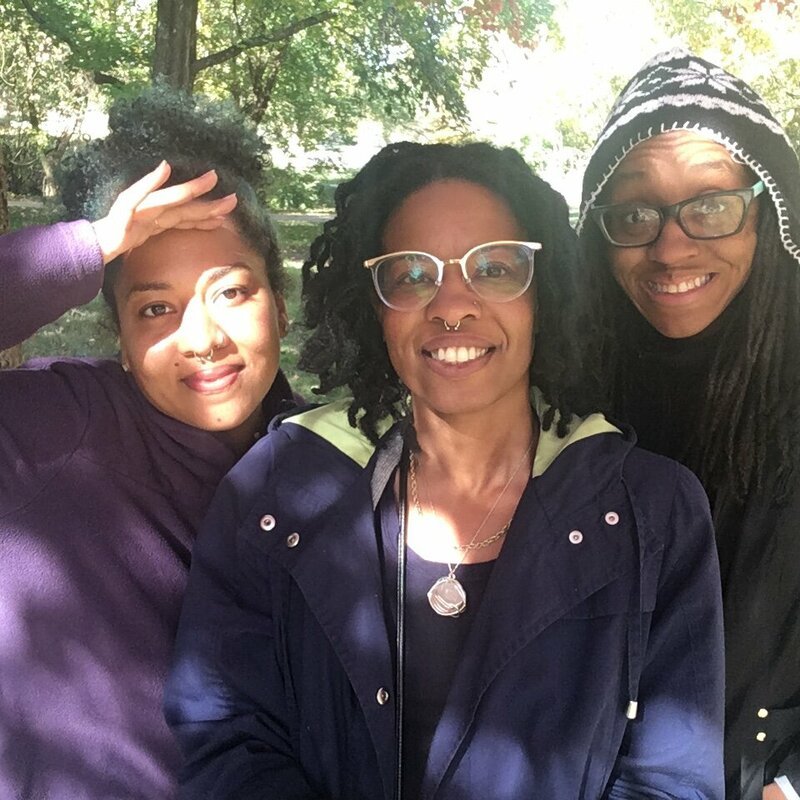 Today, Kenya Cummings, Farai Harreld, and Yolanda Acree (L to R, above) lead the work which includes profiles of fellow Black minimalists, mini e-courses for folks just getting started, a podcast, meetups, and an online directory of businesses and individuals involved in the community. Based in South Carolina, Kansas, and Maryland, respectively, the three founders gather virtually and in real life, to explore and celebrate the relationship between minimalism and freedom. ERIN: Let’s start with you sharing a bit about yourselves with RMTL readers who might not be familiar. BLACK MINIMALISTS: Black Minimalists is a community of individuals who identify as Black and live a minimalist lifestyle. The Black Minimalists community is a safe space for us to connect with each other, tell our stories, share ideas and resources, and work collectively towards liberation. While Black Minimalists centers on the experiences of Black people, we welcome other minimalists of color to share in this space with us as well. Black Minimalists launched in 2017, but Yolanda began searching out and interviewing Black minimalists on her personal site in 2015. As she encountered more and more Black folx living intentionally, the idea fomented to create a dedicated space for the growing community. 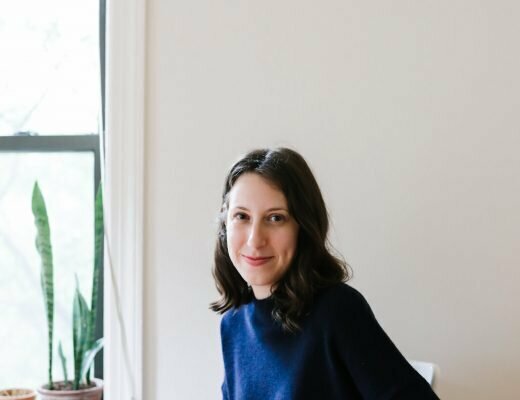 ERIN: I’m curious about how you guys define minimalism for yourselves as founders of the Black Minimalists community, but also as individuals. Would you say that the three of you have a shared experience of minimalism or are there ways that that looks different for each of you? BLACK MINIMALISTS: As a community, minimalism is a tool of personal freedom and collective liberation from oppression, capitalism, and white supremacy, among other societal constructs. We have the shared experience of living this journey as Black people occupying this space. We also have collective shared values, but also individual values based on our different realities. For Yolanda, freedom was the motivating core value that ushered her towards minimalism. The desires to have more control over her time and travel more have shaped her current lifestyle. For Kenya, her journey into simplicity has been guided by her dedication to and exploration of self-care, holistic wellness, spirituality, and activism. She has an unwavering commitment to healing and justice. Farai ventured into minimalism at the dawning of motherhood. With the responsibility of facilitating new life into this world, she hopes to create a sustainable environment to nourish herself and family. ERIN: Many folks are used to seeing visual examples of a minimalist lifestyle through a fairly narrow, and largely white, lens. More than only depicting white people’s versions of minimalism, in lots of the imagery that we see there’s an almost eerie sameness. It goes without saying that your intention was to create a community that centered on the specific values and interests of Black people who ascribe to a minimalist lifestyle. I’m really curious about what creating this space has been like for you, the kind of response you’ve gotten, and the community you’re nurturing. BLACK MINIMALISTS: The response has been overwhelmingly positive. People are always grateful for us creating this space and it humbles us every single time they let us know. For example, this summer when we had a meetup in Atlanta, we met one of our community members that has followed us since we put up the landing page in 2016! Developing Black Minimalists has been liberating for us as a team and we have been able to bond and create community. One of our core values is community, and it shows up in how we relate to one another. We have broken bread in each other’s homes and genuinely made time to be in community. ERIN: Lately I’ve found myself interested in work that starts online but that finishes in real life. I know you’ve started hosting meetups and I’m curious about how that aspect of your community has grown and what you think it might look like in the future. BLACK MINIMALISTS: The goal has always been liberation, which can not be accomplished solely online. We want our people to be free in real life. We have started with volunteer meetups, supporting community farms, and have had a couple of social meetups to learn more who we are serving. It’s challenging to push from online to real life, but being in community offline has been invaluable. 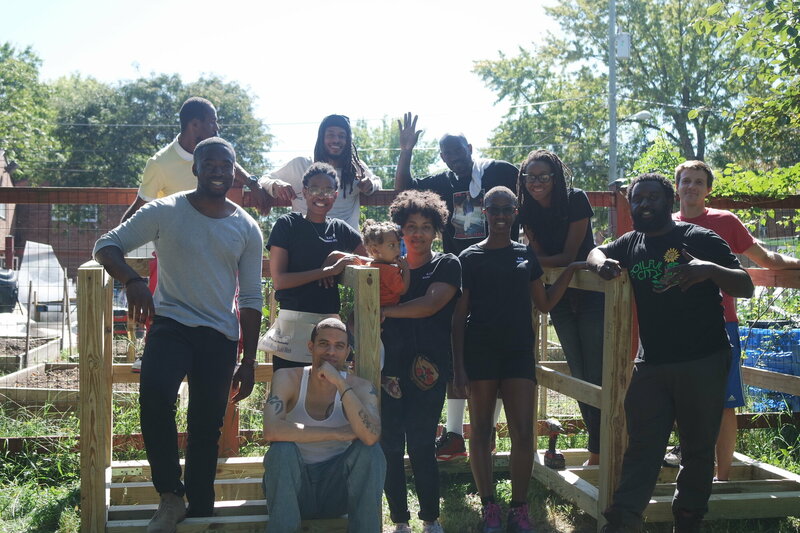 In the future we will continue supporting Black farms and showing up wherever Black minimalists are, and we envision having a Black Minimalists village one day. ERIN: It looks like all three of you grow your own food, at least in part. I’d love to hear about the relationship you find between minimalism and farming and also freedom. 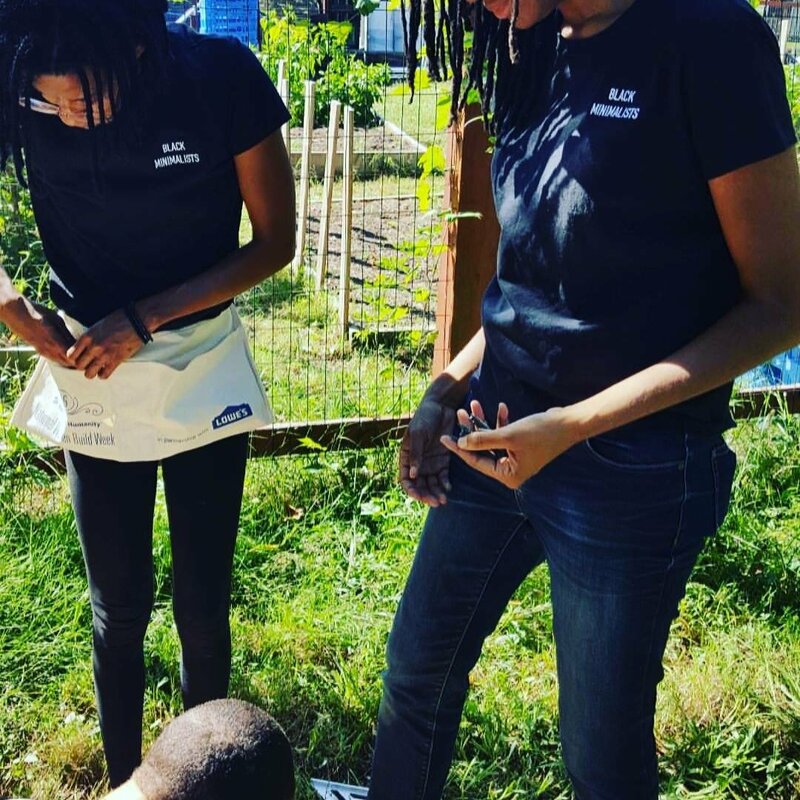 Farai is an urban homesteader, Yolanda does container gardening, and Kenya consults for a local community farm in North Charleston. Food, land, and table (community) are intricately tied to liberation. 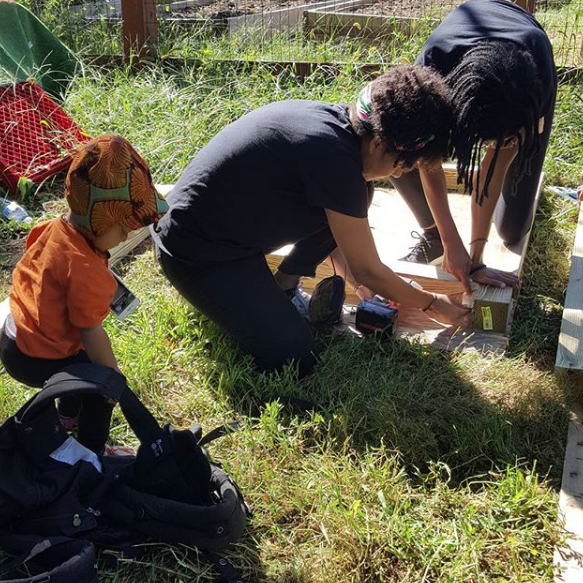 There is a lot of joy, but also trauma in the black community around farming because of slavery and its effects which continue to show up as food injustice and disparities in wealth and health markers, but we understand that returning to the land is also part of the healing process. Our ancestors from time immemorial knew the importance of having a connection to the earth that is mutually beneficial and respectful. Additionally, one aspect of this minimalist journey is learning self-sufficiency and using what we have to create the lives we want. ERIN: What’s the relationship you see between minimalism and liberation? BLACK MINIMALISTS: Minimalism is one of the tools in the toolbox for facilitating liberation. Freeing ourselves as individuals by creating lives that are whole and sustainable while sharing community, catalyzes collective liberation. Head to the Black Minimalists website to learn more about this work. To keep up with Black Minimalists on social, follow @blkminimalists. To keep up with Farai, follow @thehillbillyafrican. To keep up with Yolanda, follow @yolandaacree. To keep up with Kenya, follow @kenyaceceliarose. Sign up for the Black Minimalists newsletter for a free copy of their ebook, Simply Black: Personal Essays by Black Minimalists and periodic updates from the community. 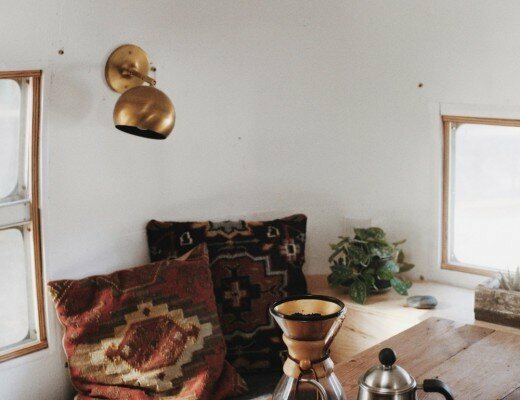 For folks hoping to dig deeper, Black Minimalists is currently hosting a mini-course: Black & Minimalist: An Introduction to Simple Living. Photos courtesy of Black Minimalists. a print for now and later. Love to see the connection between food and liberation. Thanks so much for sharing this insight! Wonderful to learn about this group’s inspiring vision and approach. Thank you for sharing and thanks to the group for participating in this interview. Thank you Erin for holding space for “simple matters” to touch on some truly profound ways this matters. I’m really inspired and in awe of the work of Black Minimalists, and deeply grateful to Yolanda, Kenya, and Farai for cultivating community and sharing their insights. Trying to find one’s niche in today’s overload of information, trends and movements is way harder that it used to be. But is there any room for any other colors in their emphasized black palette, I wonder? I would be keen to see examples of communities collaborating with each other and operating cross culturally irrespective of and without the boundaries and compartmentalizations of color. Hi Dee: these women set out to found a space that would acknowledge, celebrate, and provide resources for BIPOC in their pursuit of minimalism. In the sentence you reference here (and yes—I’ll fix that typo!) they talk about the particularly complex relationship to farming, as an example of the way that white supremacy and state-sanctioned violence against black people, in this case through the institution of slavery, has lasting impacts. I’d urge you to read Robin DiAngelo’s book White Fagility. It unpacks the ways that white people’s discomfort with acknowledgement of race and racism is a hindrance toward an anti-racist, just, and equitable future. Thank you so much for your response and I will indeed study the references you have provided. My earlier comment stems from the knowledge of how universal the issues that specific groups are attempting to tackle, irrespective of their color, really are. In the human history, and for religious, economic or ideological reasons white people have aggressively oppressed other white people(Europe) and racism has been exercized on black people by other people of color too (in Asia for example), poverty and hunger and the effects of disfunctional economies have affected people of all races, colors and classes. Why not create bridges with other people who think alike irrespective of the color of their skin? I fully understand your arguments and thank you again. I just want to see more groups of people being, open being completely open and talking about tough issues such as white supremacy, racism, poverty, what we perceive as freedom and practical ways to achieve it, together with other people; without seclusions, labels and yes, beyond the boundaries of color. Hey Dee: I trust you’re coming from a good place, but calls for unity and colorblindness and that don’t address or acknowledge the particular oppression of black people and the particular barriers they have historically faced and continue to face actually do a disservice. This is why the Black Lives Matter movement is so important. Not because people the world over have not also faced difficulties—violence, poverty, hunger. etc.—but because those things disproportionately affect people of color and black and indigenous people of color in particular. If we can’t acknowledge that the ground is not level it’s exceedingly difficult to build a bridge. Thanks so much for committing to check out those resources, I passed along. They’ve been enormously helpful to me. I think this is the crux of your issue here: “People who think alike” does not just apply to people who want what you want, or have the same goals as you. It also to some extent means “people who know where you are coming from, what you’ve been through, how the world perceives you.” This is contextual, within both time and culture, and the experiences of white people in the US will absolutely be different than the experiences of people of other skin colors in the US. I get this a lot as a woman in a male-dominated industry – many of my co-workers think that since we all do the same things, and mostly want the same working conditions etc, we all have the same experiences. We don’t. My experiences in this industry are very, very different from those of my male co-workers. Do we have some things in common? Of course! Does every single woman in this industry have all the same exact experiences that I do? Of course not! But I would go so far as to say that it would take an extreme amount of thought and intentional empathy for a man to truly “think like me” in this regard. It’s not that I won’t ever associate with men. I go out for drinks after work, make small talk and enjoy it on breaks, etc. But when I go to a created space that is specifically for women in my industry, I want to be in a space where I don’t have to feel the need to explain all these things – that, no, we don’t have the same experiences; that, yes, that is offensive; and so forth. If I seek out women in my industry, I’m seeking out a respite from needing to always live in a world build by and for someone else. Some women in my union local started a meeting group for women, but the men (the vast majority of members) complained that it was sexist. It was changed to a “young members’ group,” which was grossly offensive, not least because the women who’d started the group have been working in the industry for decades. They were not seeking to mentor young men; they were seeking to support and build camaraderie with other women of all skill levels. Now we keep any all-women’s meetings casual and very quiet. Inclusiveness can be a silencing tactic. These issues, especially – farming, and freedom – have a completely different history for black people in the US than for white people in the US. They deserve a space to move forward in the specific wake of that. It isn’t fair to put the onus of moving “beyond the bounds of color” on the people who are most directly and historically harmed by our perceptions of race and color. These perceptions shape their lives, their children’s lives, their communities, their families – they have a right to acknowledge that and talk about it, and move forward from that shared starting place. Fantastic comment, Alexandra. Thank you. But not white though, right? So maybe theirs is not such a free, open and welcoming space for all after all? Erin, I appreciate your response to Tina’s comment, especially with beginning “Welcoming you to pause to consider why a community of folks might feel the need to create such a space for themselves.” As I was reading, I found myself thinking, “I’d love to join them, but probably wouldn’t be able to because I’m white,” but took the time to pause and, as you say, consider why this group has been established as is. Black Minimalists certainly doesn’t need validation or my input, but I am really happy to see them flourish. A quick and easy mental exercise for someone who feels bristled or defensive by this group or another like it, is to imagine it on terms beyond color. Would you have the same reaction if the mission of this group was to target women? Probably not – in fact, it’s pretty easy for most of us to see why a group of women might want to come together. This isn’t an apples to apples comparison (of course!) – but it’s my best to break down the mental barrier quickly. Hopefully that makes it a little easier to understand the purpose of this group, and why it’s okay for them to actively seek a community for black minimalists and other people of color. Thank you, Erin, for also providing resources for those who respond to your post or this group’s mission with defensiveness or confusion. There are many reasons I follow you on this blog and on Instagram. For me, you provide inspiration, clarity, information and clear ways to simplify my life, house and daily schedule. As a black woman who is married to an Indian man and raising three bi-racial children in an extremely white suburb of Boston, I am always thrilled to see how you talk about race, politics and sustainability and this post continues that tradition. Thank you for being a clear voice in the midst of so much noise. 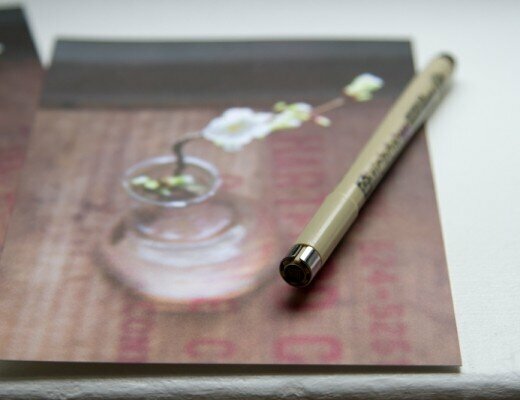 To quote the artist Titus Kaphar: “…when something is able to separate itself from the noise, the mundane of the day, I take note.” Erin–you make me take note every day. Black-only safe spaces are essential for so many reasons. Such a great post and a wonderful community. I’m glad to know of them, and learn from them, without necessarily needing to be *in* their space. Also just want to echo how singular (ie NOT universal) the Black experience in the United States is in many ways, especially with regards to land, food justice, and consumerism. By virtue of their unique relationship to capitalism in the US (and the enslavement of people as property), I will defer to Black Americans in their quest to negotiate their relationship to material culture and materialism. By all means, we should create spaces that privilege conversation and connection across experiences, but never at the expense of those that are created to support and sustain a specific community. As a non-Black POC I just signed up for their newsletter and I’m so excited to read their stories! I wonder if it would be appropriate for white folx who are working through understanding the need for a space centering the Black experience to also sign up for their newsletter, with the commitment to read, listen, and learn, without needing to contribute or comment? Consistently impressed by the way you use your platform to tackle complicated subjects, elevate others, and thoughtfully and pointedly respond to challenging comments. The work that Kenya, Farai and Yolanda are doing to create, gather and provide access to resources is so important. To dilute experience of being a bipoc in america by effectively calling for colorblindness is a disservice to the people whose day-to-day lives are shaped by the color of their skin. Allowing them a space to explore and talk about how they move through the world is the least we can do. Supporting them in their journey is to do one better. If the purpose of responding to or referencing comments from other readers, is to alienate or deter them from further engaging in a conversation they deeply care about, then this is also a diservice to the cause and the purpose of said topic. I assure you that colorblind I certainly am not, and I was extremely careful to express some of my instant thoughts in a respectful manner. I am not sure why 3/4 of the comments here are scolding and annoyed. The responses received were part of the lesson I am taking with me. Greetings and loving kindness from over the pond. Hi Dee: Understood that a number of people responded directly or indirectly to your comments, but I don’t think that the purpose was to alienate or deter further engagement. On the contrary, I think folks are encouraging you to engage with the notion that there’s a specific and unique experience of black people in this country—and the world—and that it’s because of that that these women decided to found a community to reflect their particular experience. I think folks, myself included, are using the term colorblind here because several times you referenced engaging in these discussion “irrespective” of color.